At Jupiter Motorcycle Transport & Storage, we take care of your bike with the best motorcycle services in Jupiter, FL. We specialize in providing motorcycle transportation, towing, shipping, climate-controlled/humidity-controlled 50% storage (perfect for storing vintage cars and motorcycles), valet parking (motorcycle drop-off and pick-up) and emergency roadside assistance service throughout the Palm Beach area. Our equipment is designed specifically for motorcycles and we offer exemplary punctual customer service. 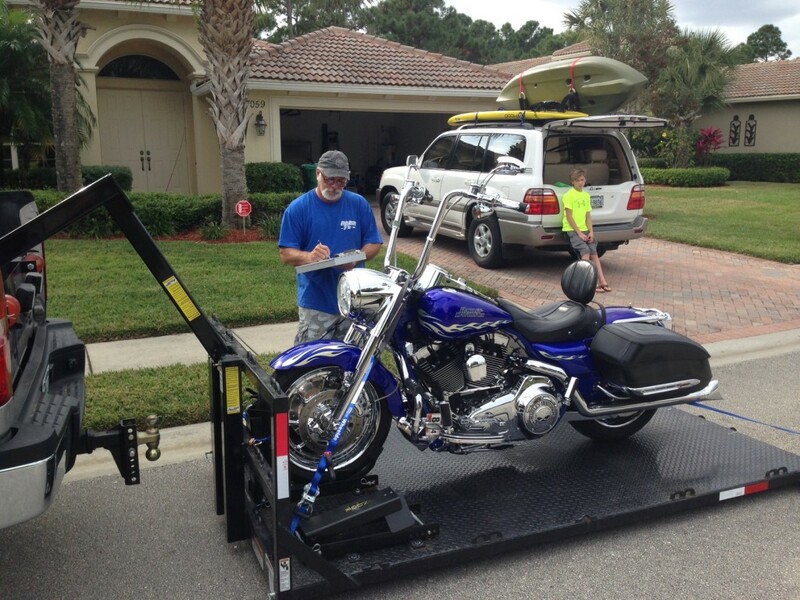 Motorcycle Towing, Transportation and Storage Services in Jupiter, FL and more! We make sure your motorcycle is protected and use a top-of-the-line loader with a hydraulic lift system to safely load your motorcycle. Because we don’t use the traditional fold-out gate or deck, there is much less risk of damage. We make sure to always provide exceptional care for your bike.